The Parade of Homes is a self-guided home tour that is free and open to the public from 12-5 p.m. each day of competition. REALTORS® and home building industry leaders select the winning homes in their respective price categories. 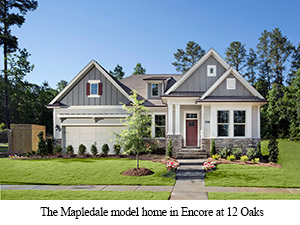 Weekley’s entries include: The Valwood model home in Briar Chapel, The Mapledale model home in Encore at 12 Oaks, The Bentridge model in the builder’s newest community of Montclair and The Devonbrooke, a Custom Classics model home in Dunhill. The two–story Valwood is approximately 2,200 square feet with three bedrooms, two full baths, one half bath, a retreat area and large covered porch. The home sits on a 40-foot homesite at 33 Old Piedmont Circle in Chapel Hill. 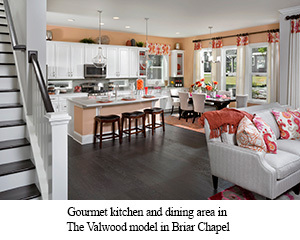 Briar Chapel homes are priced from the $305s. The Mapledale, located at 109 Sour Mash Court in Holly Springs, features more than 2,700 square feet of living space with three bedrooms, two full baths, one half bath, a study and a second-floor bonus room. Encore is David Weekley’s new lifestyle-designed approach to home design that features open, single level floor plans with expanded outdoor living areas, low-maintenance living and high-quality craftsmanship for 55+ buyers. Encore at 12 Oaks homes are priced from the $350s. In Montclair, The Bentridge is located at 202 Mill Chapel Road in Chapel Hill and offers 3,257 square feet of living space. This two-story home features three bedrooms, two full baths and one half bath. Homes in Montclair are priced from the $415s. The Devonbrooke is a two-story, 3,500 square-foot home ready for immediate move in. The home boasts four bedrooms, three full baths, one half bath, a retreat area and a three-car garage. The home is located at 6121 Moinear Lane in Chapel Hill. Custom Classics homes are priced from the $640s. For more information about David Weekley homes in Raleigh, homebuyers may call 877-542-9240 or visit www.DavidWeekleyHomes.com.